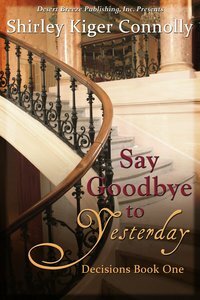 About "Say Goodbye to Yesterday (#01 in Decisions Series)"
An unwed mother who disregards her childhood faith and gives up her innocence early is about to make a greater mistake that could change her life forever. When Annabelle Jordan's secrets are discovered by an unforgiving church community, she and her daughters are booted from town. Now without home or future for her growing family, Annabelle, no longer young nor ready to rekindle a once-cherished faith -- is convinced her only hope is to find the girls' father and force the marriage he pledged but later abandoned, or raise her daughters alone which offers no guarantee of security. But when the irresistibly handsome man of faith, Major Carlton Radcliffe, pledged to a family of his own, crosses Annabelle's path, he also steals her heart. To offer her daughters the future they so desperately need, Annebelle must make the right choice. She could vow never to marry a gain and raise her girls alone providing them with no respectable future; she could continue her journey to the one who rejected her twice already; or she could risk ruining the reputation of the one man who now occupies her heart. What other choice does she have?